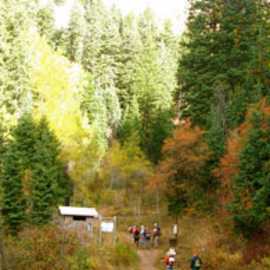 1.75 mi/2.8 km one-way — The Elbow Fork trailhead starts 6.4 miles up Millcreek Canyon on the south side of the road, about 200 feet past a sharp turn. 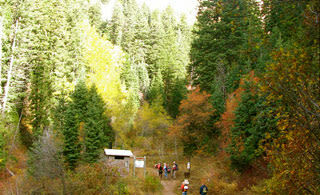 Start walking at the footbridge and proceed through a short series of steep switchbacks to reach an excellent view area. The trail then continues with a gradual ascent and crosses a ridge before descending to the Terraces Picnic Area. With a change in elevation of only 430 feet, this trail is great for families. Situated on the north-facing slope, the trail is shaded, making it a perfect choice for summer hikes.